Central American migrants, hoping to ask for asylum in the United States, are being relocated to a temporary shelter in Tijuana, Mexico. Volunteers from San Diego visit the migrants weekly to help with health care. The Trump administration announced this past week that asylum-seekers would no longer be released into this country while their claims are being processed. Instead, they will be sent back to Mexico to await a hearing before an immigration judge. There are already thousands in Mexico, waiting just to ask for asylum. 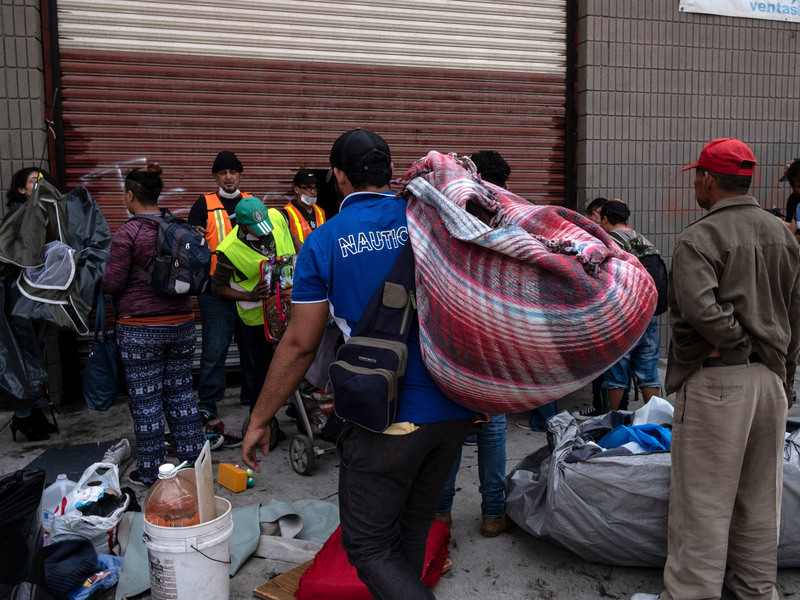 In Tijuana, a caravan of Central American migrants arrived last month and are currently living in close quarters in shelters. As temperatures drop, there are concerns about the migrants' health. So, once a week, a group of doctors, nurses and volunteers cross the border from San Diego to provide medical care. Nurse practitioner Karen Linares is one of those volunteers. When Linares heard about the migrant caravan in Tijuana, she felt a personal connection to the thousands of Central Americans waiting in Tijuana. She was adopted from Honduras at as a 7-year-old. Growing up in Oregon, she said she always wanted to start a medical clinic in Honduras and work in medicine. She's now 39, and living in Palm Springs. Through a facebook post, she learned about the volunteer project organized by San Diego Border Dreamers, and immediately signed up. "Just knowing that my raza [are here], which is like my people from my country, I felt I was obligated to come," she says. Linares drove two and a half hours on a Sunday to join the group of about a dozen medical volunteers. Many migrants are now living in large government-run shelters that are serviced by Mexican government health-care professionals. But there's also a number of informal shelters in the city, where there's little to no health care. So that's where Linares and the others focus their attention. This day, the group went to a private home that now serves as an LGBTQ shelter, to check on about 25 patients. A 20-year-old man was complaining of tension headaches and body aches. One of the doctors, Lucy Horton, handed him Tylenol and asked him if he was stressed. He nodded his head. "Do you have any family with you? ", Horton asked. "Are you just by yourself?" The man answered, "Si," and began to cry. "Well you've made it really far," the doctor said, trying to comfort him. Family medicine Dr. Julie Lu Do of San Diego gathers medicine and supplies before the group heads out to treat migrants. She's part of a group of volunteers who go down to Tijuana weekly to help with health care. Diana Aguirre was on hand to help with translations for the doctor. Like Linares, Aguirre felt a personal connection to volunteer on this trip. She was born in the U.S. and lives in northern San Diego county. But her grandmother and mother illegally crossed the Mexico-U.S. border decades ago. "I wanted to do more than just donate money. I wanted to do something hands on," said Aguirre. But she didn't realize it would be such an emotional impact. "I can't imagine being young and feeling all alone and not knowing what's going to happen," she added, choking up. " Just to be there for him was worth the entire day." Besides visiting the LGBTQ shelter, the group went from makeshift shelters to tent camps to provide basic medical care. In all, they cared for more than 100 migrants in a day. 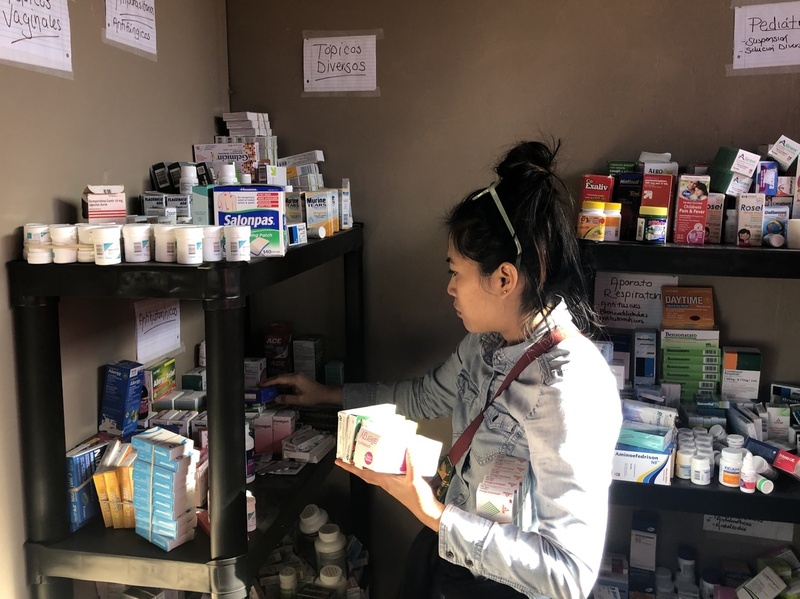 The doctors handed out cold medicine, ibuprofen and antibiotics that they purchased in Tijuana with money from donations. Typically, they treat colds, fevers and upper respiratory infections. But the care and medicine they provide is crucial to preventing any viruses that could spread like wildfire throughout the overcrowded camps and shelters. The group also monitors for any symptoms of a potential outbreak of highly infectious diseases like measles or chickenpox. If they see anything, they flag it to the Mexican government. The medical group usually finds out by word of mouth where medical care is most needed — like at a YMCA in the middle of town that houses teenagers. 17-year-old Radonis was staying there. He asked that we do not use his full name out of security concerns. He's from Honduras and says he arrived in Tijuana after having travelling through Mexico by riding on top of trains and by walking. Before he got to the shelter, he slept on the beaches in Tijuana. But now he has a deep cough. "From Mexico City to here, I was sick," he said in Spanish. "I had everything, a cold. I was really sick." So the doctors hand him some cough drops. And for now, he has time to recuperate in a safe place. "I feel like I'm home," Radonis added, "I'm improving every day."